I've been studying equipment racks, feet and support systems for a while now. I was fully and gloriously immersed in Michael Green's Clamp Rack and AudioPoint mechanical grounding and resonance tuning system. These products made the sound of my system take a large step forward in "sophistication". It sounded like a much more expensive system with the components properly supported on AudioPoints and clamped in Clamp Racks. But then I discovered isolation. I knew about isolation a long time ago... after all Navcom and Sorbothane feet were moderately good at isolation, but they never sounded very good as audio component feet compared to AudioPoints for example. But Bright Star Audio's Ultimate Isolation system uses a much better isolation system combined with mass damping and RF/EMI reduction. When I replaced the Clamp Rack and AudioPoints with a Bright Star Audio UIS... the sound quality of the amplifier took yet another step forward in terms of how sophisticated it sounded. Backgrounds became more silent, detail became more audible without any artificial enhancement. Soundstage depth improved enough that it made me question what I was hearing from a solid state amp - only tube amps do depth this well... supposedly. It may be that solid state amps just need the benefit of isolation and damping to approach the "tube standard" of depth performance. My experience with the Bright Star Audio UIS has made me a convert to isolation and damping - most of the time. There are still times when AudioPoints with or without clamping in a Clamp Rack give certain components a little extra something they need to perform well. But in my system, I have just about completely converted to isolation and damping, some from Bright Star, some home-brewed. If you have some kind of cones or soft feet under your components and think/thought they sound a lot better than the stock feet on the component... the Bright Star system could more than double the perceived improvement you heard when you changed to cones or other feet. What we have here in Bright Star's product may be the best commercially available reasonable cost audio component support system that is available to audiophiles. Yes, there are other products. The circa $2,200 (all prices quoted are US $) "passive" Vibraplane requires hand pumping periodically or an optional motorized air pump to keep the isolation surface floating. The optional pump adds hundreds to the cost and is quite noisy when operating. A more expensive "active" Vibraplane sells in the $5,000 range. The Vibraplane comes to the audio world from the scientific & laboratory instrument world. Vibraplanes work well as audio component isolation devices. Another alternative, the Seismic Sink isolation devices sell in the $150 to $850 range depending on size and the maximum weight they can support. But both the Vibraplane and Seismic Sink devices address only the "isolation factor". Neither provides a high mass "reservoir" to trap internal vibrations from the component and damp them. Neither Vibraplanes nor Seismic Sinks addresses the benefits that can be had by damping vibrations generated by or picked up by the component. And neither offers any RF/EMI reduction capability. The Bright Star Audio Ultimate Isolation System (UIS) addresses isolation, damping component vibrations and reduction of EMI/RF (either radiated from the component or attempting to enter the component externally). The Vibraplane is a "dynamic" isolation system that continuously looses a little air while in operation, hence the need for the motorized air pump. The resonant frequency of the Vibraplane is very low, contributing to superior isolation ability. The Seismic Sink devices, like the Bright Star system, use closed air bladders to provide "floatation". The Seismic Sink devices have much higher resonant frequencies than the Bright Star UIS or Vibraplane which can limit isolation performance. The Bright Star UIS consists of 3 parts. Each can be purchased separately or together as a UIS. Different sizes are available to accommodate different sizes of components. The smallest UIS (the Ultimate Isolation System 3) retails for $300 total for all 3 pieces. This size is appropriate for CD players, preamps, DACs, and similarly sized products. I used the next larger size UIS 2 which was just right for my 55 pound OCM-500 stereo solid state amplifier. Retail price of this size UIS is about $478. Let's look at each of the components of the UIS separately. The Air Mass is a low rectangular box with no bottom. The sides are a little less than 3" high. The box is constructed of mdf (medium density fiberboard) similar to that used in speaker cabinets. The finish is speckled granite-look paint, medium gray or near-black, your choice. When you turn the Air Mass upside down, you see an inner tube glued to the underside of the top surface of the Air Mass. To make the inner tube easy to pump up, Bright Star runs a plastic tube from the valve on the inner tube through the side of the Air Mass where it is easily accessible for pumping with the optional hand pump, though any bicycle pump will work fine. That's all there is to the Air Mass. An empty mdf box with 4 sides and a top, and an inner tube glued inside. The more expensive Air Mass models for larger and heavier components are more complex. This may seem pretty low tech and like not a lot of content for the $99 to $539 (TNT model with extra cost black granite paint) list price. But the more expensive Air Mass models have up to 4 individually adjustable cells and they hold up to 300 pounds. Barry Kohan of Bright Star Audio indicated that the selection of the inner tubes was a major undertaking. But it had to be done to keep the retail price of the Air Mass reasonable. Commissioning custom air bladders would have added too much to the cost of each Air Mass. List price for the Air Mass 2 I'm using with my 55 pound 200+ w/ch stereo amp is $159 ($175 in the black granite paint). The Air Mass 2 will support up to 120 pounds. The $99 Air Mass 3 holds up to 100 pounds and is the perfect size for most DACs, transports, CD players, preamps, etc. These lower priced Air Mass models use a single air bladder (inner tube). The Air Mass is best used on a rack shelf or on top of a low amp stand. You can use the Air Mass alone to achieve a high degree of component isolation but it really comes into its own when used with the Big Rock and Little Rock. This is another empty mdf box. Thick mdf is used because these boxes have to hold 18 to 70 pounds of dry sand depending on the size of the Big Rock. A top plate goes over the sand. You receive the Big Rock empty. You must purchase a bags of dry play sand (check it carefully, some brands and stores are misleading and you'll find the sand is damp when you get it home and it is a pain to dry). My last dry play sand purchase set me back $2.60 for 50 pounds. You use a bit less than 1 full 50 pound bag on the 2 smallest Big Rocks, but more than 1 bag will be needed for the larger sizes. You are provided with a leveling tool made from cardboard. You fill the box and pull the leveling tool across the sand until the box is uniformly full. Drop the top cover on and it is ready to use. It's hard to spend more than 30 minutes to 45 minutes doing this. Shipping costs for filled Big Rocks would add too much cost to the product to be practical. If you think you need help doing this, try to schmooze your dealer a little. Once you get the sand in the Big Rock, you put it on top of the Air Mass. Then you put the component to be isolated on top of the Big Rock. Barry Kohan says he thinks the stock feet on the component are fine when used with a Big Rock and Air Mass combination and I agree. You don't have to have expensive feet when using the Air Mass and Big Rock. I have found that I like the sound of components best when they are supported on home-made sand filled bags more than when using the stock feet on the component. With the turntable, I like the large Whatchamallit lead shot & silicone RTV feet better than factory feet or sand bags when using the Bright Star Air Mass & Big Rock combination. Besides acting as a mass damping device, the Big Rock mass loads the Air Mass to lower the resonant frequency of the Air Mass quite a bit. This lower resonant frequency improves the isolation performance of the Air Mass enough to make adding the Big Rock quite worthwhile. Prices for the Big Rock range from $99 to $305 for the largest size in extra cost black granite paint. The model that is sized to match preamps, CD players, DACs and transports and similarly sized components costs $99 and weighs 20 pounds full of sand. The Big Rock 2 that I'm using with my amplifier lists for $149 (add about $20 for black granite paint) and weighs about 35 pounds with sand. The larger Big Rock 1 that just arrived for the turntable lists for $175 and weighs about 64 pounds with sand. Bright Star has custom sizes for some popular component combinations like some of the Audio Alchemy separates. The Little Rock initially feels like a solid slab of metal painted the same gray or black granite-look paint as the Air Mass and Big Rock. But when you look closely you see a plug in one side. Whatever is inside the Little Rock, if anything, is one of Bright Star Audio's trade secrets. The owner/user is left to speculate about what might be in there. Some people think it holds ferrite BBs or powdered ferrite metal or that the "plate" is not really hollow. Whatever... as the 3rd element of the Ultimate Isolation System, the Little Rock further mass loads the Air Mass for another reduction in resonant frequency. With all 3 pieces of the UIS and my 55 pound amp, the mechanical resonant frequency of this isolation/damping system is in the 1.5Hz range, very very low. The Little Rock sits on top of the component on top of little rubber feet. If the Little Rock will go on top of a tube preamp or on top of a warm-running solid state or tube amp (tube amps must have enclosures or roll bars or something that will support the 30 or 40 pound Little Rock) you'll need some kind of "spacer" feet to raise the Little Rock a bit to permit good ventilation. The Little Rock is definitely an effective contributor to the overall success of the Bright Star UIS. Retail prices are in the $79 (10 pounds) to $179 (29 pounds) range depending on size needed. I'm using the $179 Little Rock 2 with my amplifier. There must be something about the UIS that is not ideal... Well, yes, there is a "problem". The full 3-piece UIS requires a lot of vertical space. More space than many rack systems will permit. Just how much extra vertical space do you need? Total vertical space varies slightly depending on the model of UIS being used. The smallest size, UIS 3, sized for preamps, CD players, etc. is 5.75" high as shipped. Add 3 or 4 inches for typical preamps, CD players or DACs and the total height required can be 10" (a little extra head room is needed for inflation of the Air Mass and to permit a little motion without hitting the shelf above). You can save up to 0.5" by removing the 0.25" rubber feet on the Big Rock and Little Rock if needed. But tube preamps with top venting probably need an extra 1" of space between the Little Rock and top cover of the tube preamp. The larger UIS 2 totals up to 7" without the component being isolated. Add 1/8" for inflation of the Air Mass and a little overhead clearance. In many cases the UIS can more than double the vertical space required for each component. In my estimation, the results of using a UIS far outweigh the initial inconvenience that may be required to change racks or reconfigure existing racks. Bright Star combats the extra vertical space requirement by making their own rack system with the same granite-look colors and lots of space for each component so each one can be UIS'ed. The Gibraltar racks range in price from $499 for 3 components which weighs 46 pounds empty to $1999 for a 6 component rack which weights 202 pounds empty. The Gibraltar 3 (three shelf positions - retail $599) and Gibraltar 5 (five shelf positions - retail $999) are supplied with Big Rock platforms as the shelves themselves. Air Mass and Little Rock are not included in the rack prices. Big Rocks are optional for Gibraltar racks other than the 3 and 5. Certainly it is easy enough to use a UIS with an amp on an amp stand or with a turntable on the top shelf of a rack system or on a dedicated stand. If you have Clamp Racks you can remove shelves (you won't want to Clamp after hearing what the UIS does anyway - in most cases). If you have a Justarack or Deluxe Justarack you can get longer threaded rod "legs" to permit spacing the shelves farther apart. No matter what rack you use, you need clearance around the component and around the UIS "stack". Rubbing walls and dragging interconnects or power cords have to be dealt with so that the "stack" floats as freely as possible. It should bob up and down slowly when you push down on a corner of the stack. This "bobbing" needs to happen as easily as possible. You can usually achieve this even with heavy power cords or interconnects, but it takes good clearance and a little freedom to route cables along paths that let them stay away from wall rubbing or floor sticking. That's about it... 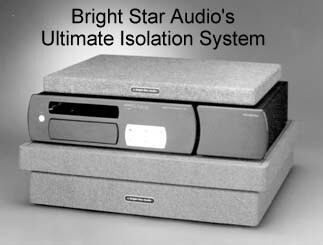 Bright Star Audio's Ultimate Isolation System is one of my "standout" product finds for 1996. I wasn't expecting isolation/damping to "beat" mechanical grounding and resonance tuning, but it does in most cases. The improvement heard from Bright Star's system can be as much as, subjectively, double the improvement you hear from the best of other support systems and significantly more than double any perceived improvement from soft replacement feet or inexpensive cone-type feet. I can't tell you for certain whether a $300 Ultimate Isolation System 3 or $478 Ultimate Isolation System 2 sounds better than a $2,200 Vibraplane. The Vibraplane may well offer superior isolation compared to an Air Mass alone. But the Vibraplane has no mass damping and no ability to block RF/EMI. The Bright Star UIS does more than other isolation-only products for comparable or much lower cost. I liked the performance of the UIS so much that I already have an Air Mass and Big Rock on order for my turntable - I'll report the results here when I've explored the combination fully. We at Bright Star Audio would like to thank Doug Blackburn and SoundStage! for the wonderful review of our Ultimate Isolation System. It is our goal to provide audiophiles with the finest vibration control products available, regardless of price. That Bright Star products are among the most affordable in the industry is a testament to our straightforward and cost-effective designs. Our patented Ultimate Isolation System creates an environment of high mass , high absorption and shielding around a component for the highest degree of vibration control. A multi-stage (multi-component) isolation system is required to address all of the sources of harmful vibration - both externally generated by loudspeakers, heating & A.C. systems, traffic, etc., and internally generated by motors, transformers and cooling fans. Using only a pneumatic platform (no matter how expensive it may be), for example, is inadequate because it will only address vibration trying to enter from under the component. It will do virtually nothing to repel air-borne vibration or to absorb internally generated vibration. The Ultimate Isolation System: 1) restricts floor-borne vibrations through the Air Mass and Big Rock, 2) the rigidity of the component's chassis is significantly enhanced by the mass loading of the Little Rock/Big Rock combination so it can more effectively repel air-borne vibrations, 3) internally generated vibrations are effectively absorbed into the patented Big Rock base, while 4) the Little Rock provides RF/EM shielding. This is the most comprehensive vibration control system in the industry! I would also like to take a moment to discuss another unfortunately somewhat popular method of vibration control - products which attempt to "tune" or manipulate vibration and resonance instead of eliminating them. The recordings we play on our audio systems have captured a musical event and contain the unique and fragile interplay of instruments which bring emotion and musical fulfillment to the listener. To play back these recordings with utmost fidelity we must make sure that our audio systems do not alter the musical signal. To do so is to take us further away from the faithful recreation of the musical event. Each instrument captured in the recording has its own resonant signature. That is the correct nature of musical instruments. The playback system, however, is not a musical instrument. Its function is to play back many different recordings of many different instruments. The most faithful audio system will not exhibit resonance and reproduce only what is contained in the recording - nothing more and nothing less. As soon as the electronic signal is contaminated and altered by resonance the damage has been done. There is NO WAY to remove the results of the resonance contamination. A vibration control product that merely attempts to manipulate the resonance (by changing the component's resonant frequency) instead of eliminating them may result in a more "pleasing" sound than letting the resonance run rampant but it cannot claim to allow the component to accurately reproduce the signal it has received. Vibration and resonance must be eliminated from audio (and video) components so that they are not colored by their effects and subsequently do not color the signal they are processing. Only then can the true nature of our components and recordings be fully realized. We invite audiophiles to contact us for full information and test reports. PS. Regarding the internal structure of the Little Rock pod: Little Rock is an MDF frame which is filled at the factory with two metals and three minerals in a certain proportion. This "secret sauce" mix allows the Little Rock to provide high mass, shielding and resonance absorption.